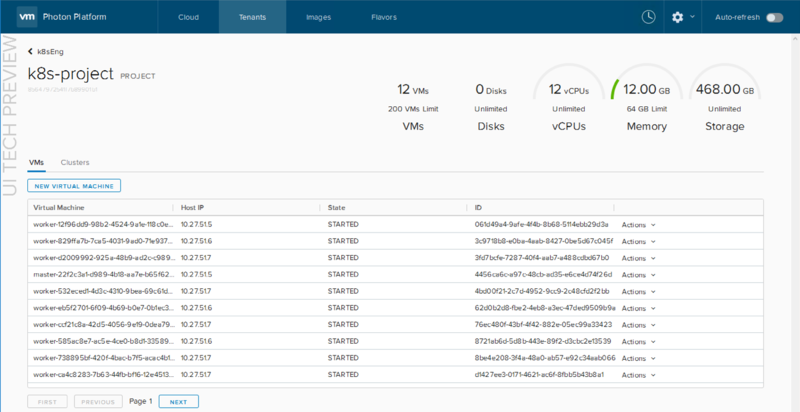 I mentioned in a previous post that we have recently released Photon Controller version 1.1, and one of the major enhancements was the inclusion of support for vSAN. I wrote about the steps to do this in the previous post, but now I want to show you how to utilize vSAN storage for the orchestration frameworks (e.g. Kubernetes) that you deploy on top of Photon Controller. In other words, I am going to describe the steps that need to be taken in order for these Kubernetes VMs (master, etcd, workers) to be able to consume the vsanDatastore that is now configured on the cloud ESXi hosts of Photon Controller. This is what I will show you in this post. 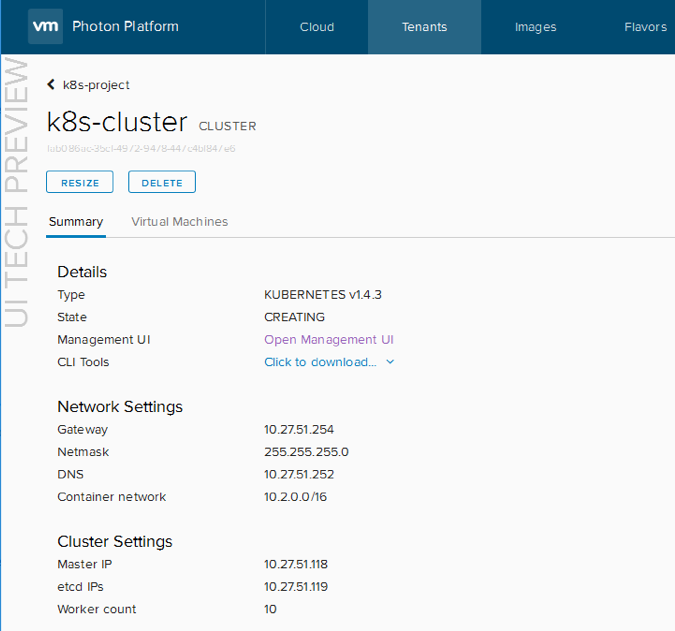 I have already highlighted the fact that you can deploy Kubernetes as a service from the Photon Controller UI. This is showing you another way of achieving the same thing, but also to enable the vSAN datastore to be used by the K8S VMs. While you can do all of the following steps manually, here is a script that I used to set up networks, tenants, images, flavors and so in photon controller, before eventually deploying Kubernetes. You will notice that there is a reference to an image called “kubernetes-1.4.3-pc-1.1.0-5de1cb7.ova“. This can be found on the photon controller 1.1. release page on github here but be aware that the number may change. You will need to download the OVA locally, and modify the script to point to the correct location (if not /root) and the correctly named OVA. You will also need two static IP addresses for the master VM and the etcd VM in the cluster create line near the bottom. You will need to modify the ip addresses that I used, as well as gateway, DNS and netmask info that is correct for your environment. I have also chosen to deploy 10 worker VMs, and these will pick up IP addresses via DHCP. You can change this number as needed. Then it is simply a matter of selecting the correct target by running “photon target set http://ip-address-of-photon-controller” and then running the script. Just to be clear, this is provided as is, with no support whatsoever. But I have used it a few times myself and it seems to work fine. echo "... create network ..."
--description "Dev Network for VMs"
echo "... load image ..."
echo "... enable k8s on deployment ..."
echo "... create disk flavor ..."
echo "... create vm flavor ..."
vm.flavor.cluster-other-vm 1 COUNT,vm.cpu 1 COUNT,vm.memory 1 GB,vm.cost 1 COUNT"
echo "... create tenant ..."
echo "... create ticket ..."
--limits "vm.memory 64 GB, vm 200 COUNT"
echo "... create project ..."
--name k8s-project --limits "vm.memory 64 GB, vm 200 COUNT"
echo "... create cluster ..."
The way in which we are consuming vSAN storage for these VMs is the inclusion of a disk flavor called “vsan-disk”. When we create the cluster at the end of the script, we are specifying this as a disk flavor using the “-d” option. If you have problems, add a -x to the #!/bin/bash in the first line of the script to get debug output. Here is a sample run of the script. examine task for full details. You can run 'cluster show ' to see the state of the cluster. Either way, once the master and etcd VMs are deployed, you should be able to navigate to the tenants, images and flavors section of the Photon Controller UI, and examine the cluster. Under Tenants, click on the k8sEng tenant (or whatever you called your tenant). Then under projects, click on the name of the k8s-project (or whatever you called your project). This should show you the master, etcd, and worker VMs as they are deployed. From there, click on Clusters, followed by clicking on the name of the cluster. In the summary tab, you can click on the option to Open Management UI, and this should launch the Kubernetes dashboard for you. The Kubernetes dashboard can then be handed off to your developers. 42 objects would account for the master, etcd and 10 worker VMs , when you add in boot disks, swap files and home namespaces. And of course, you have many other RVC commands to use, such as vsan.cluster_info and of course the health of vSAN using vsan.health. PS – I also created an “undeploy” script to run through the process of tearing down this Kubernetes cluster afterwards. This uses the same names for tenants, project, clusters, etc, as the “deploy” script, so if you change them, you will need to edit the “undeploy” script accordingly. echo "... cluster show ..."
echo "... disable k8s in deployment ..."
Once again, you can run through all of these steps manually if you wish, but the script approach may save you some time.